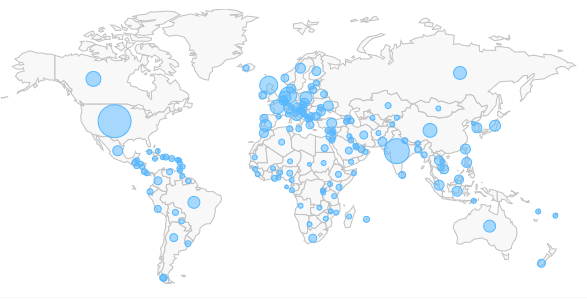 Described as “the most comprehensive developer survey ever conducted,” the Stack Overflow survey tallied the responses from 56,033 developers in 173 countries. While this survey isn’t a scientific sample, it’s an intriguing set of data, since the site has been polling its user base once a year since at least 2013. Some of the survey’s results seem obvious — for example, that there’s a strong correlation between compensation and job satisfaction. But other data is much more fine-grained and useful. 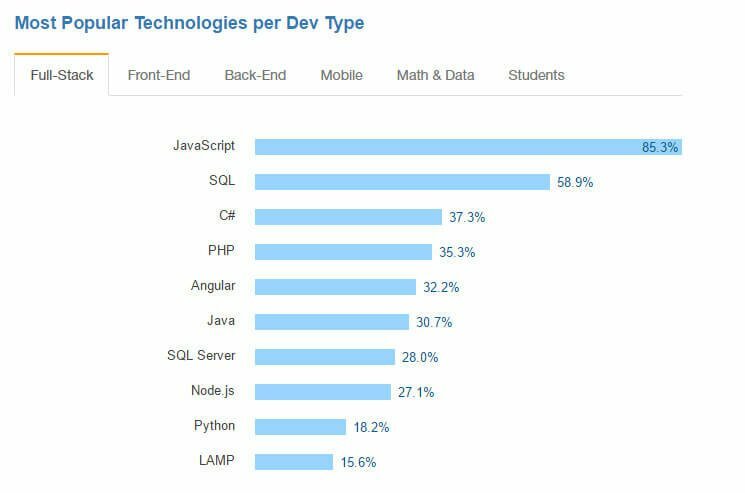 Twenty-eight percent of the respondents identified themselves as full-stack web developers, while 12.2 percent were back-end developers, and 5.8 percent were front-end developers. The survey covered more than just the technologies being used. It also revealed data about the programmers themselves. But their survey suggested that the site wanted to offer their own support. “We can’t claim to know the answer to bridging the gender gap in tech, but we think sharing data with the public is a productive step in advancing more dialogue across the industry,” the statement read. Of the 56,033 responses they received, 13,540 came from the U.S.A. — about 24 percent — with another 4,573 in the U.K. (8.1 percent), 4,193 in India (7.4 percent), 2,024 in Canada (3.6 percent), and 1,117 in Australia (2 percent). But less than 4 percent of the survey’s respondents were over the age of 50, with 52.0 percent between the ages of 20 and 29. “The average developer is 29.6 years old,” reported Stack Overflow. “The median is 27.” In fact, 7.1 percent were below the age of 20 (presumably some of whom are students). In addition, 69.1 percent of the survey’s respondents said they were at least partly self-taught, and 13 percent of respondents across the globe even said they were only self-taught. “The education data is really important to us,” Rogers added. “The fact that 69 percent of respondents are partially self-taught, yet only 25 percent use online training and only 7 percent have participated in an industry certification program validates that there’s a real need to expand our educational resources and training opportunities at the Node.js Foundation. This also seems to have led to a stark age divide on one crucially geeky question: Star Wars or Star Trek? Every group below the age of 50 chose Star Wars by a hefty margin — but that margin started to shrink as the cohorts got older. And more respondents in the 50-59 age bracket chose Star Trek (52.5 percent) than Star Wars (31.4 percent), while in the over-60 group, Star Wars drew just 29.3 percent of the vote (while Star Trek drew 47.0 percent). Firefly was the top write-in, followed by Stargate, Doctor Who, and Babylon 5. Over the last four years, the Windows desktop platform has been cited by fewer and fewer of the survey’s respondents, and it’s now down to just 52 percent (down from 60 percent in 2013). And meanwhile, there’s been an increase in the popularity of Linux ( 22 percent) and Mac OS (26 percent) among users of the site. In a possibly-related piece of trivia, just 59 of the 56,033 responses came from Windows Phone Mobile Developers or .1 percent. Ubuntu claimed 12.3 percent of the entire OS market and was by far the most popular flavor of Linux.